As part of Kilomet109’s most recent collection, Phiêu, we collaborated with artisans from the Blue H’mong community in rural Hoà Bình, Vietnam. We worked together to design batik motifs on our linen, cotton, and silk fabrics. 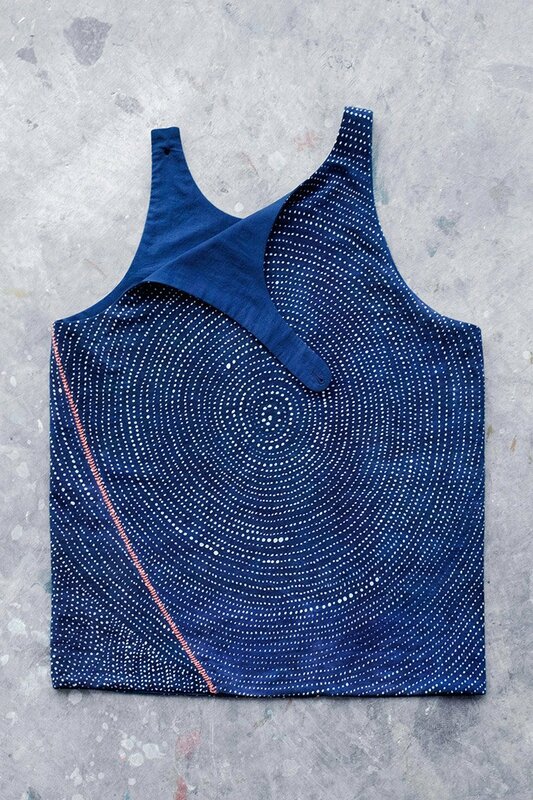 Normally, Blue H’mong artisans apply this technique to their own textiles, creating traditional patterns. 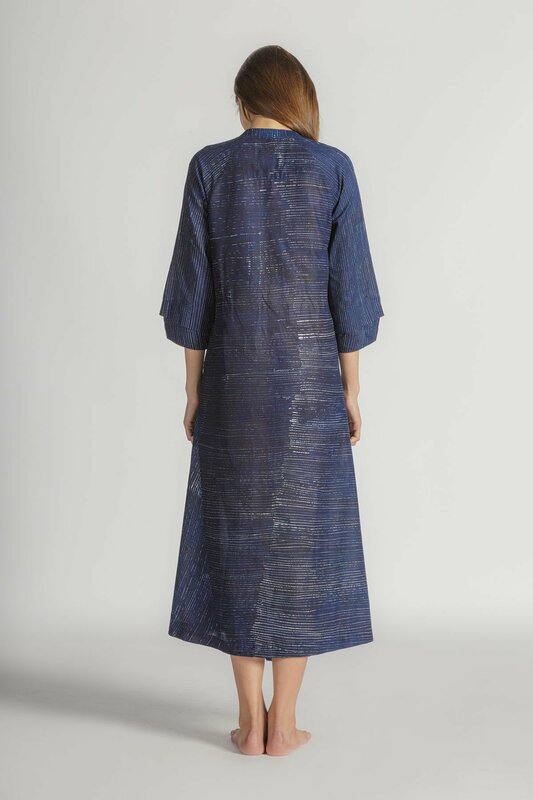 For Phiêu, however, Kilomet109 designed new patterns that create the basis for many of the pieces in our collection. 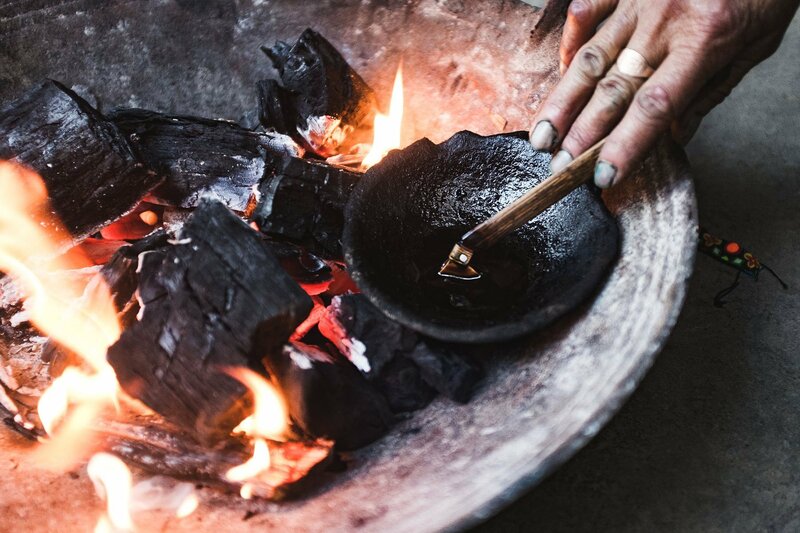 How the process works: To draw batik designs we first melt the beeswax in an iron bowl over a coal fire. Secondly, a special copper tipped bamboo pen is dipped in the melted wax, much like dipping a feather pen in an inkwell, and then used to draw directly onto the fabric. Finally, after soaking the fabric in an indigo vat multiple times, we boil it to make the beeswax peel off. As a result of this process the dye resistant beeswax drawing retains the original fabric color. During a textile research trip in 2016, Kilomet109 head designer, Thao Vu, noticed that the Blue H’mong artisans were using multiple batik pens and stamps to create their traditional patterns. This made the drawing both time consuming and overly redundant for the artisans. The resulting designs were pretty, but felt overly conventional. More importantly, we thought this change in approach would help to push the artistic boundaries of what a single tool could produce. After finishisng her research, Thao sketched three new patterns (cheque, lines, and polka dots) and sent them to the Blue H’mong artisans to execute. Thao asked the women to try using one pen type, instead of many, to create the different line and polka dot sizes in her designs. The thinking was that this change in approach would help to push the artistic boundaries of what a single tool could produce. The stripe dress and batik double tunic dress are wonderful examples of this effort. We couldn’t be more pleased with the modern geometric patterns that resulted from this process. The batik motifs have quickly become some of the most sought after pieces from our Phiêu collection.